Daniel Sister explores the physiology of the aging face and explains how non-surgical treatments can deliver the desired results without the downtime associated with more invasive procedures. A non-surgical facelift is now a realistic option for patients who desire to fight the aging process without resorting to surgery. 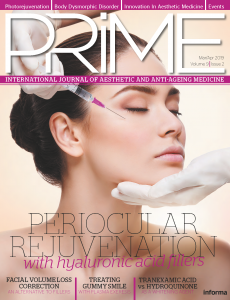 In this article, the author looks at how and why the face ages, and addresses how a younger looking face can be achieved using non-surgical techniques. A lack of elasticity (due to loss of elastin), alterations in the texture of the skin, and muscular relaxation1,2. The bone and cartilaginous structures become more visible as the skin and subcutaneous tissues get thinner, the texture of the skin is altered and convexities turn into concavities (temporal, perioral, and orbital areas). Modifications in the face proportion. 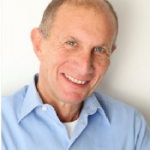 This is how we can achieve ‘invisible lifting and rejuvenation’ without resorting to surgery. Understanding the aging process and how each different component (skin, muscle, fat, bones) is modified and/or altered by the aging process allows practitioners to specifically design the best combined treatments to achieve optimum results. In the lower third, there is a reduction in height because of the loss in the mandibular and maxillary bone structures, thinning of the skin and subcutaneous tissues as well as an increase in width because of ptosis of the middle third. Meta-face: tissues are firmly anchored to the deep planes. Other factors such as photoaging, smoking, sun exposure, hormonal changes and gravity also have an impact on the skin. The adipose tissue of the face is distributed roughly equally between the deep and superficial layers, divided by a superficial muscular-aponeurotic system (SMAS). The superficial portion is a continuous uneven layer interfaced with fibrous septa that connect the SMAS to the dermis. The deep layer is divided into distinct anatomical compartments delimited by ligamentous structures. It consists of three compartments in the frontal region, three in the periorbital areas, and five superficial and four deep areas in the cheeks. The intraorbital fat, the medial cheek fat, and the nasolabial fat together constitute the malar fat pad. 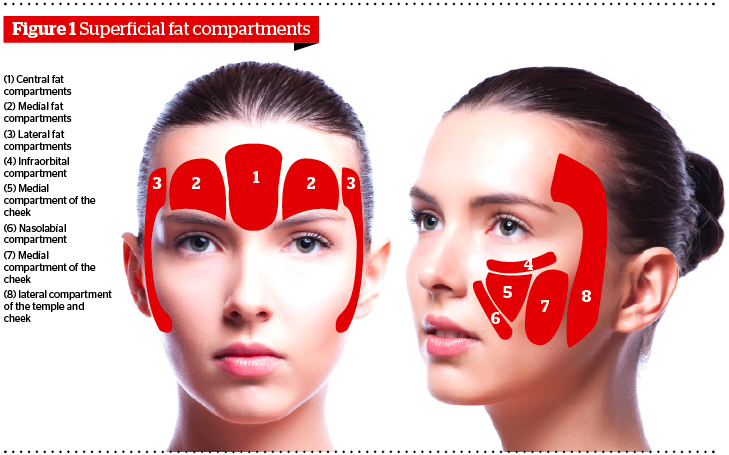 In the lower part of the face, the most important fat compartments in relation to aging are the jowls and mental fat compartment, and the superficial and deep mental fat, which are responsible for the rounder shape of the area4,5. As time goes by the fat tissue is redistributed, the face loses its fullness and fat bags begin to appear as distinct and separate compartments. With age, the malar fat pad tends to slide down revealing the inferior orbital rim and contributes to the formation of naso-labial folds6. In the author’s experience, these separate regions experience the effects of the aging process at various times in a person’s life. Therefore, the concept of separated adipose compartments explains why the face does not age as a single mass but is characterised by the changes that each of these different compartments undergoes at different times. Some areas are subject to atrophy of the soft tissues (frontal, temporal, periorbital, perioral, jaw and chin areas) and others become hypertrophic (submandibular, nasolabial, labiomental, cheeks, infraorbital fat bags, and malar fat pads7. The weakening of the malar and orbital ligaments is one of the more common events related to the aging process. One consequence is the sliding of the malar fat pad downwards and medially over the supporting ligaments of the nasolabial folds, this causes the cheeks to appear hollow. The orbital ligaments also become weaker and this contributes to the appearance of a depression below the orbits. While some muscles get looser, others are actually tightening with age as proven by the platysma bands, permanent and deep crow’s feet, and even when the tip of the nose plunges. The most obvious signs of this can be seen in the platysma bands of the neck, which stretch from the chin to the collarbone area and become more pronounced with age. This effect can also come about in the form of permanent crow’s feet and deep-set glabella lines between the eyes. In addition, both the major and minor zygomatic muscles, because of the undermining of the ligament and muscle connections, give the face a frowning look and contribute to accentuating the labiomental folds. The most significant change in the facial skeleton occurs in the facial apertures, or ‘holes’ of the face, such as the nose and the eyes. 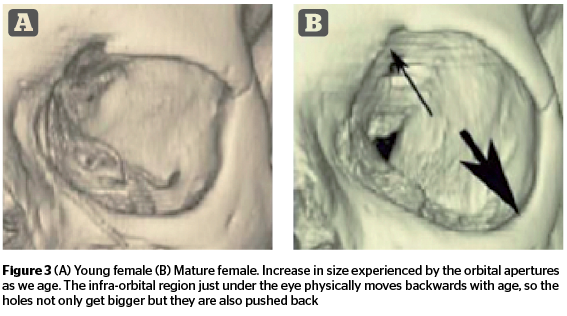 The orbital apertures, or eye sockets, actually increase in size with age and the bone of the infra-orbital region below the eye physically moves backwards with age, so the holes not only get bigger but they are also pushed back8. This contributes to the lower, sunken-looking lower-eye area. The process of bone reabsorption results in an overall reduction in bone volume. The effect of aging in the lower part of the face occurs initially in the mandibular profile. The progressive reabsorption of the jaw bone can lead to the development of a hypoplastic chin and to the formation of a front mandibular furrow9. There is also a particularly atrophic area in the front of the mandibular groove10. To stop the upper-lip elevating too much (gummy smile). 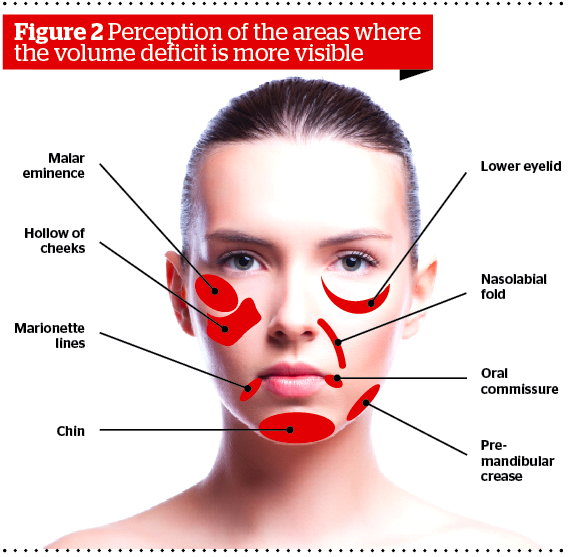 The temporal area is a small and often forgotten region of the face. It is mainly composed of the temporal muscle and the underlying adipose tissue. The aging process will generate a depression caused by the atrophy of the muscle and adipose tissue12. In the mid-third of the face there will be a loss of skin elasticity, and a loss of volume to the deep fat of the mid-cheeks, which will cause a downward and forward descent of the malar fat pad. The result will be deeper nasolabial folds because the cheeks are more prone to relaxation. The atrophy of bone tissue plus the increase in laxity of the orbicular ligament and zygomatic cutaneous junction ligaments will cause a descent of the malar-palpebral fat pads and an elongation in the lower eyelid. When the orbits increase in size and the jawline shrinks it makes the nasolabial folds more visible13–15. 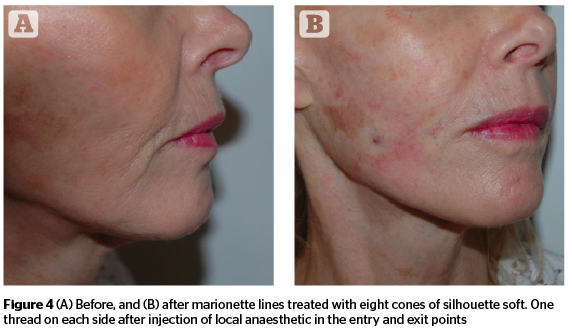 It is possible to recreate a harmonious jawline by injecting dermal fillers into the two depression points of the pre and post jaw, but this is only creating an optical illusion. Depending on the type of filler used (density) they can be used to attenuate folds or to recreate volume where it has been lost (temporal, cheek bones, and lips) and even to reshape a nose. Tightening of the inner arms, thighs and/or abdomen. The Nobel Assembly at the Karolinska Institute awarded the Nobel Prize in Physiology or Medicine in 1986 jointly to Stanley Cohen and Rita Levi-Montalcini for their discoveries in 1953 of ‘growth factors’. Neural growth factor and epidermal growth factor were the first of many growth regulating signal substances to be discovered and characterized. During the last decade, several other growth factors have been isolated and characterized by different research groups. Offer differentiation for fibroblasts and osteoblasts. Favours the synthesis of collagen and significantly increases type I collagen production in tendons. Stimulates angiogenesis, chemo-attractive to osteoblasts. Stimulates proliferation and differentiation of epidermis cells. Osteocalcin, Osteonectin, Fibrinogen, Vitronectin, Fibronectin, and Thrombospondin (TSP). In addition, the activated thrombocytes have on their surface a multitude of signalisation molecules: CD9, CD-W17, CD41, CD42a-d, CD51, CD-W60, CD61, CD62P, and CD63. Platelet rich plasma is a well-documented and efficient procedure for implantology26. In sport medicine, PRP treatment has proved its efficacy even with only one session. 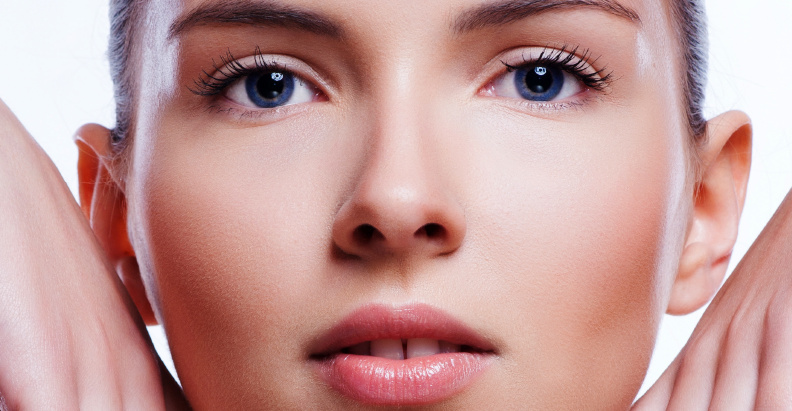 In recent studies, injections of PRP in the face and neck for revitalization obtained good results28. In aesthetic medicine, an Amgar study29 used biometric parameters for scientifically measurable means of assessing the results from injections of 4cc of PRP. 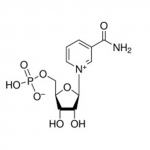 The study also demonstrated that the effects of one PRP treatment could last for up to 10 months. The fibroblast and the epidermal/dermal junction. The botulinum toxin will act on muscle contraction and eliminate active lines, the dermal fillers will correct the loss of volume, and the bi-directional threads will do the lifting and repositioning of the fat pads. Rohrich R J, Pessa J E The anatomy and clinical implications of submuscular fat. Laver L, Carmont MR, McConkey MO, Palmanovich E, Yaacobi E, Mann G, Nyska M, Kots E, Mei-Dan O. Foot & Ankle Spec. 2014 Apr 25. Redaelli A, Romano D, Marcianó A. Face and neck revitalization with platelet-rich plasma (PRP): clinical outcome in a series of 23 consecutively treated patients. J Drugs Dermatol. 2010;9:466–472.